As part of the Initiating phase of a project, a Work Breakdown Structure (WBS) should be delivered. I usually prepare a high level planning using Microsoft Project. It’s not really a WBS, but more a milestone and hammock tasks Gantt chart. I always wanted to present it as a real WBS diagram but never found a good and simple tool to create it. Here is now the solution; the WBS Modeler add-in for Visio 2010 that allows generating the WBS based on a project plan, or the other way, generates a project plan based on a WBS. This add-in has been released end of 2011 by Microsoft (initially developed by David J Parker, Microsoft MVP for Visio). Windows XP Service Pack 3 or later with Visio Professional 2010; not that there is also a version for 2007 available), Project 2003 SP 1 or later AND Microsoft .NET Framework 4.0. You can download the add-in from this page. The installation is very simple; it’s a series of “next” buttons. Now let’s create the WBS in Visio based on this project plan. Open Visio, then under Template Category, click on Add-Ins. 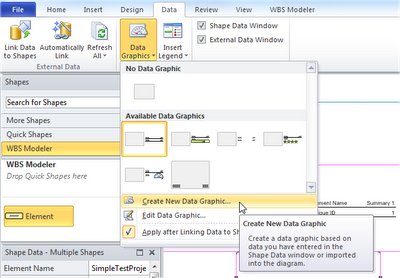 Select WBS Modeler and click on Create. On the WBS Modeler tab, click on the Import button. Select the level from which you want to import the data, and click on Draw. Very simple to do, isn’t it? On the WBS Modeler tab, click on Export button. Note that on the generated Project file, tasks contain constraints, Finish No Earlier Than for tasks and Start No Earlier Than for milestones which was not the case on my initial Project plan. Going forward: Is it possible to maintain the link between the 2 files, to be able to update the % complete from Project to Visio? This is a question I have been asked, and I tried to find a solution that does not involved custom coding. I found some block post with the following good idea: Project can Export data to Excel, and Visio can get updates from Excel as External data. Export your Project plan to Excel using Save As. Choose Selected data and click next, then create a new map. Select Tasks and Export includes headers. Select fields you want to map; in this example I will use % Complete and Cost. Unique ID is mandatory to link tasks in Visio (note that for the purpose of this article, I put some costs and % complete on the first tasks). You can then save the map for future use. You can also create a small macro to execute such task if this is something you want to often use. Now let’s make the link in Visio. 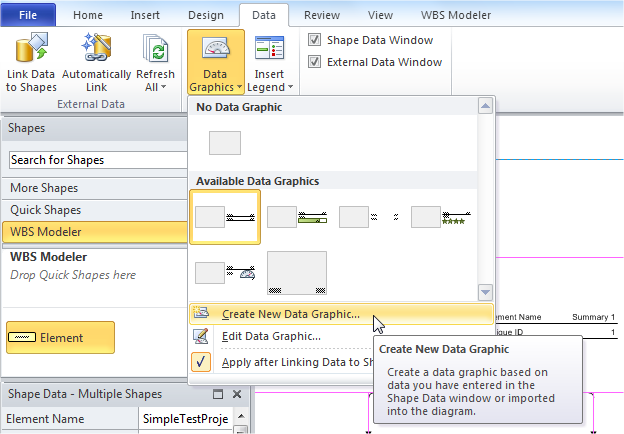 Click on Data tab and select Link Data To Shapes. Select Excel as Data you want to use (note that SharePoint is also an option you can test). Follow the wizard. On the following screen, we need to define which field will make the link between the data (Excel export) and Visio tasks. Upon Finish button click, Excel data is embedded into Visio document as External Data. To match the existing name in Visio (Shape field), we need to rename columns. On the External Data window, right-click and select Column Settings. Click on Rename. You have noticed that you can also change data type and column width. We have the data; we have the tasks; now we need to make the link. Right click on the External Data window, and select Automatically Link…. Select All shapes on this page and click Next. The next window defines the link between the Data column and the Shape Field. Let’s configure it to display needed information. Create a new Item for Cost and define it as Thermometer (this is just to show it, Thermometer may be better used for indicators like Schedule Performance Indicator or Cost Performance Indicator). If you don’t want to see only 0.5 or 0.65… you need to multiply the % Complete per 100 to reflect percentage. This is the WBS we get from this little customization and what I now use to communicate with senior management. For your next updates, you have to save again your Project plan as Excel file with the same mapping (after updating it of courseJ). Then on Visio, right click on the External Data window and select Refresh Data…. Found a simple way to do it, hope it will fit your requirements. I tried your trick of rotating the diagram and this didn't really help. Do you know of another way to get the old vertical arrangement that was in Visio 2007 modeler? Don't know if this can help, go on Design tab, and click on Re-layout page, if you select Flowchart > Left to right you have a kind of vertical arrangement. Maybe you want to try www.wbs-tool.net for WBS. hi there I have Visio 2010 and MS project 2007 once I open the Modeler it prompts me to select the project and it does not do anything after hitting ok. any reason why? I feel satisfied with your blog, you have been delivering useful & unique information to our vision even you have explained the concept as deep clean without having any uncertainty, keep blogging. Big project always have the big problems, the basic problem for the every project is to understand the following of big data and its complexity which is not easier to understand by a common man. So form here the work of data scientist is started you have to chose the best data scientist which can solve your all data complexity problem and you can get them from activewizards.com/. Very nice...Thanks for sharing the work break down structure...Really nice.. Your way of explaining is very nice to sharing..Keep update your post.. It is an informative Blog..Thanks for sharing this useful and interesting article..Best IEEE Project Center in Chennai | IEEE Project Center in Velachery. Your way of explanation is very nice..Amazing post.. Your Blog is nice and informative..Thanks for sharing...Data Mining Projects Center in Chennai | Data Mining Projects Center in Velachery. I gathered lot of information from your post..
Our Project work going in on chennai region kindly update the boom lift rental in chennai member. I am following your blog regularly and got great information. Keep blogging.!! I am currently working on Blue Prism and want to give certification exam for the same. What is the procedure? I have already registered on Pearsonvue.com. What should I prepare and what is the level of exam? We are facing challenges in writing automation scripts (using Selenium) prior deployment of code. Always, we are able to write them post entire development is done and hosted in some server. Basically, we wanted to have the script written during the development period so that when a developer launches them, we can utilize the automation scripts as a sanity check when ever we deploy them in different places (such as testing/staging environment, UAT environment and then to production). Is there any alternative approach that we can follow to overcome this challenge. Appreciate any help in this regard. Informative blog and it was up to the point describing the information very effectively. I know that the question might be strange since RPA and DevOps are two different paradigms, but I am looking for documentation about Blue Prism integration within a DevOps pipeline (like CA or IBM Cloud). Is there any documentation about actual or future integrations of Blue Prism with DevOps pipeline? I have Wait stage for Username exists with timeout 5 seconds after browser launched with Gmail. Now my problem is execution is not moving further from Wait stage after successfully browser launched with Gmail login. Please find the attached screenshot. Please help me to resolve that issue. Wait stage is not working? Nice blog. Thank you very much. Thanks so much for this article! I tried to follow some instructions from few other article and got in over my head. This worked so quickly and your instructions were very easy to follow. Really appreciate this. I've been doing an object and a process to interact with SAP. In some steps, I need to select or give a click to some tabs inside the window. I've tried to identify the window where these tabs are, but the error is still the same one. I’ve tried to identify the element with Windows, Region and Winds application mode (out of SAP mode) and it gives the same error. Any idea, guys? I ask for your help. Thanks for the post, it’s a great piece of article. Really saved my day. Let say there is a folder which have files like 'ABC_04032018' & 'ABC_05032018' and I have to pick a current date file from blue prism certification dumps vegas folder which is 'ABC_05032018'. how I achieve this. How I select a current date file from folder using BP tool? I have excel file that has 50 records. I would like to take only 10 records and save to collection stage and then blue prism certification help manhattan looping for remaining records. Could you please help me to resolved the issue? Looping the collection of 10 records in Excel sheet using the Blue Prism? Enlightening online journal and it was up to the point portraying the data adequately. Online casino is the best that can be. roulette casino games online Playing casino is a lot of fun. It is a good job! I really liked this post. Thanks for giving wonderful content and please continue the more unique post.